Derry's Oisin McWilliams against Niall Colsh of Sligo during the Electric Ireland All-Ireland GAA Football Minor Championship Quarter-Final in Ballybofey. Derry will meet either Dublin or Clare in the All Ireland Minor Football Championship semi-final and a thrilling, one point quarter-final victory over Sligo at MacCumhaill Park, Ballybofey. Paddy Quigg was the late, late hero for Damin McErlain's team with an injury time point to finally kill off the challenge of an excellent Sligo side who had fought back from three points down to level the game as it ticked into five minutes injury time. Derry went into the game a pre-match favourites but it took a brilliant second half display and a fantastic Richie Mullan goal to turn things around after Sligo, with Red Og Murphy superb, threatened to upset the form book in the opening 30 minutes. Murphy hit 0-11, including seven from frees, but it still wasn't enough as not for the first time this season, McErlain's young team found the mental reserves to win a game that looked to be going away from them. It was a first half to forget for Derry as Sligo, with the wind at their backs, bossed proceedings with Murphy tormenting the Oak Leafers on his way to a first half tally of 0-8, five of which came from frees. Derry badly seemed to missed the influence of injured full backs Conor McCluskey and Simon McErlain, who were only fit enough for a place on the bench, and lacked their normal intensity through a slow laborious build which was allowing Sligo to funnel 13 men behind the ball. Derry's shot selection was uncharacteristically poor with a first half wide count of nine compared to Sligo's one, the Oak Leafer constantly over complicating thier build up and looking for a tight intricate pass which was never there amid the massed ranks of the Sligo rearguard. Ironically it was Derry who got off to the better start when Dungiven's Richie Mullan threw a lovely dummy before pointing with one minute on the clock. Two Murphy frees had Sligo ahead by the fourth minute and at this stage it was the deep running of half forward Luke Towey who was giving cause for concern within the Oak Leaf camp. Fergal Mortimer, who had come in for McCloskey was finding himself playing at full back too often for Derry's liking as Sligo pushed up on the Derry kick and greatly limited the impact of the Oak Leafers talented midfield duo of Paudi McGrogan and Oisin McWilliams. Paddy Quigg levelled for Derry before Murphy and Ciaran O'Dowd edged Sligo 0-4 to 0-2 ahead again but a Declan Cassidy point kept Derry in touch. All the while the Oak Leafers were becoming frustrated as shots dropped short or wide while Sligo made much better use of their attacks to build a 0-10 to 0-5 lead with Red Og Murphy superb and scoring off both his right and left foot. Derry had goal chances, notably in the 19th minute when McGrogan burst on to a clever touch down by Quigg but his fierce shot was brilliantly turned away Sligo keeper Alan Davey. Derry reduced the interval deficit thanks to a Oisin McWilliams point and should have brought it back further but a late Quigg wide from a very scorable free summed up a poor half from Derry. Both McCluskey and McErlain were introduced at half-time and while Barry Gorman was gifted an easy score inside the opening minute, the Derry intensity levels had obviously been ramped up by their manager's interval team talk. Trailing by five, three points inside three minutes from McWilliams, Quigg and substitute McErlain changed the complexion of the game and left Derry only two behind at 0-11 to 0-9 in the 37th minute. That was the start of a eight point swing that took Derry from five down to three up. a McWilliams free closed the gap further before the game's crucial score, that goal from the livewire Mullan. it owed everything to Tiarnan McHugh though. The big Drumsurn forward was second best to a high ball forward on the right wing but shrugged off Brian Cox to make the ball his own before feeding Mullan who arrived off the shoulder at pace to stride forward before firing a superb low finish past Davey for a 1-10 to 0-12 lead. Odhran Quinn added a lovely score and when Quigg stretched the advantage to three points at 1-12 to 0-12, Derry finally looked in control but Sligo weren't finished. Corner forward Cian Brett grabbed a point before an innocuous looking challenge brought Murphy his 10th score of the day from a 48m free to leave one between them with two minutes left. Derry were denied a blatant free in the attacking zone and were made to pay a hefty price as that man Murphy hit a superb score from wide on the left to tie the game as the clock reached full-time. Five minutes injury time were signalled and before the first had passed, Derry led again through a brilliant Quigg free. McWilliams looked to have stretched the lead before it was bizarrely disallowed. It didn't matter. Derry had done enough and would be headingt o Croke Park. 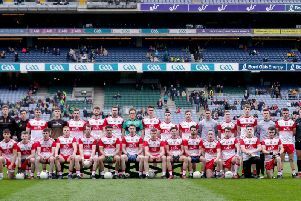 Derry: Oran Hartin; Oran McGill, Odhran Quinn (0-1), Sean McKeever; Declan Cassidy, Dara Rafferty, Conleth McShane; Padraig McGrogan, Oisin McWilliams (0-4, 3f); Patrick Quigg (0-3, 2f), Richie Mullan (1-2), Fergal Mortimer; Ben McCarron, Tiarnan McHugh (0-1), Cormac Murphy. (Subs) Conor McCluskey for D Cassidy, HT; Simon McErlain (0-1) for C Murphy, HT; Callum Brown for C McShane 48mins; Mark McGrogan for T McHugh, 49mins; Martin Bradley for D Rafferty, 52mins; Conor Quinn for O Quinn, 64mins. Sligo: Alan Davey; Evan Lyons, Brian Cox, James Weir; Karl McKenna, Evan Lavin, Oisin Conlon; Niall Colsh, Barry Gorman (0-2); Roland Anderson, Luke Towey, Ciaran O'Dowd (0-1); Conall Ryan, Red Og Murphy (0-11, 7f), Cian Brett (0-1). (Subs) Oisin Higgins for R Anderson, 37mins; Conan Marren for C Ryan 44mins;Ben Tuohy for J Weir, 48mins; Josh Ellis for C O'Dowd, 55mins; James Carroll for C Brett, 64mins.